The Riviera is a place in France that has long been thought of as the best tourism region in the world. It is certainly one of the oldest and for that reason there are many places around the world that attempt to imitate parts of the Riviera whenever they can. The Riviera Hotel and Casino in Las Vegas is definitely one of those places as it has the stated goal of bringing some of the charm of Europe to North America and adding some excellent new world luxury to it while they're at it. The Riviera Hotel and Casino has done a lot to accomplish this goal, so take a look at the analysis below and then decide for yourself whether they have accomplished their goal. The Riviera Hotel and Casino is actually located on the Las Vegas Strip, albeit a few blocks away from the area of the strip that has most of the big resorts. This provides it with the advantage of being away from the hustle and bustle of the main strip area and this means that you should be able to sleep at night without hearing the blaring of horns and the yelling of drunk people on their way home from a night of gambling. At the same time however, its proximity is still close enough that you can walk from the Riviera Hotel and Casino to any of the other major tourist destinations in Las Vegas, including several of the best dining, entertainment and gambling venues around. The Riviera Hotel and Casino is actually in the middle of spending millions of dollars on renovations and this means that several of their larger rooms are unavailable. However, there are still plenty of rooms to go around in their standard, superior and deluxe categories. The standard is a typical luxurious Vegas hotel room, while the superior and deluxe are about as luxurious as anything else you can find in the city. The drapes and bed covers are done in different styles and textures while there is more than enough lighting in the room for you to enjoy the other amenities like televisions and internet connections in some cases. Some of the renovating has been finished as well, the result of which is the new category of signature rooms. These rooms are bigger and better than anything that the Riviera Hotel has come up with before and they include ultra-modern technology combined with fantastic fashion sense. There are many extras available to you at the Riviera Hotel and Casino. Aside from the obvious casino extra, the Riviera Hotel and Casino is home to a fantastic spa service, a wedding chapel, shopping venues and wonderful restaurants that serve great food. They also have an arcade inside, making them stand out from most of the other resort destinations in Las Vegas . 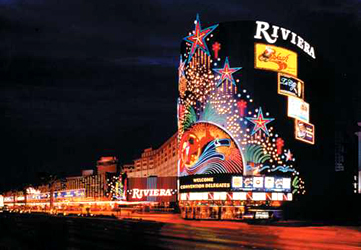 The Riviera Hotel and Casino is primarily an accommodation giant with the extras being secondary to the sheer brilliance of the rooms that they offer. For this reason, they make a great resort for someone looking to sleep half the day in the lap of luxury and that is of course the dream vacation for many people around.